Veles is situated on the, the E-75 international highway. Veles located on 48 km from the capital Skopje and from the nearby city Stip, is just 40 away, while from Negotino is 41 km and from Kavadarci is 52 km away. Veles grew in the 19th century into an important centre of trade. During the period of former Yugoslavia the city was called Titov Veles, regarding to the ex Yugoslav marshal Josip Broz-Tito (1893-1980). Now the town is predominantly industrial. There is a smelter for lead and zinc, a porcelain factory and a silk factory, as well as leather and metal industries. Agriculture, viticulture and market-gardening are fairly well-developed. Veles is a town with a rich cultural tradition. In honor of the founder of modern Macedonian literature, Koco Racin, the Racin Meetings, in which writers from all the Balkan countries take part, are held here. 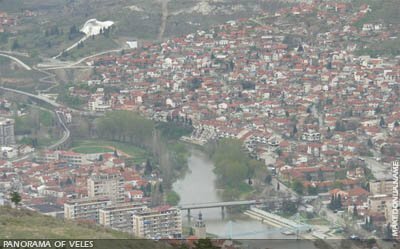 Veles is a significant industrial, trade and transport center of Macedonia and has 46,570 inhabitants. 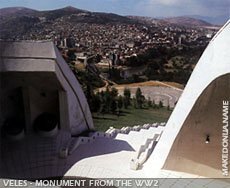 Situated on the main route linking Central Europe with the Aegean, Veles was also an important trade center in the 19th century. Now Veles is predominantlyindustrial. There is a lead and zinc smelter, porcelain and silk factories as well as leather and metal industries. Agriculture, viticulture and market-gardening are well-developed. Veles is a town with a rich and varied cultural tradition. It is the birthplace of Koco Racin, the founder of modern Macedonian literature. About twenty kilometers south of Veles, near the Kumanovo-Gevgelija motor way, lies the most famous archaeological site in Macedonia, the classical town of Stobi. This town, dating from 197 BC, was the capital of the Roman province of Macedonia Salutaris. The surviving mosaics and other archaeological finds are of exceptional value. Some important historical monuments in Veles are the Churches St. Dimitrie, and St. Nikola which were build in the 14th century. Also there is the church St. Pantelejmon built in the year of 1840. There are more churches in the town that are build on the bases of an older churches.